The crippled sleeper ship Hispania arrived in Omicron Alpha almost 800 years ago. 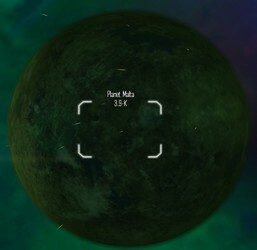 Its passengers named the planet Malta -- a harsh place of acidic oceans, gray skies, and vast plains covered in a species of tall, thin, orange grass. They later learned that the grass could be rendered into a narcotic substance, that they called Cardamine. Eventually the Outcasts -- as they came to think of themselves -- began limited exploration of their system. As pilots wandered farther and farther afield in search of resources, many became seriously ill. Upon planetfall, the crews mysteriously recovered. Doctors were baffled. By chance, they made a genetic scan of a critically ill pilot and made a startling discovery. His genetic codes had been altered. Outcast DNA contained strands identical to that of the orange grasses that covered the planet -- from which Cardamine was derived. Trace amounts were present in everything on the planet, from the air they breathed to the water they drank. Once pilots made lengthier journeys away from Malta, their bodies went into shock, followed by death. The Outcasts were now truly separated from the rest of humanity -- changed so that they could never expand beyond the planet on which they had landed. They needed the Cardamine now, like air or food or water. But with the origin of the sickness solved, they could at least compensate by carrying supplies of Cardamine with them and resume their exploration of their surrounding systems. When they encountered the rest of the Houses in the seventh century, a new strategy emerged. The Outcasts would deliver the poison that would rot the other Houses from the inside out and grow rich from the profits of their trade. Today the Outcasts conduct a lucrative drug-smuggling operation using the network of Jump Holes to escape detection and transport their product into the heart of the House systems. The Outcasts remain relatively few in number; a crash in the birth rate seems to have been another side effect of their genetic modification. A new development has been Cryer’s continued efforts to create a synthetic version of Cardamine that would be approved as a legal medication within Liberty. This poses a direct threat to the Outcasts' source of income. The Atka Research Station, with nearby access to Edge Nebula clouds, is the most immediate threat to the Outcasts. The location of the base within Corsair territory has brought the Outcasts into conflict with their ancient brethren.